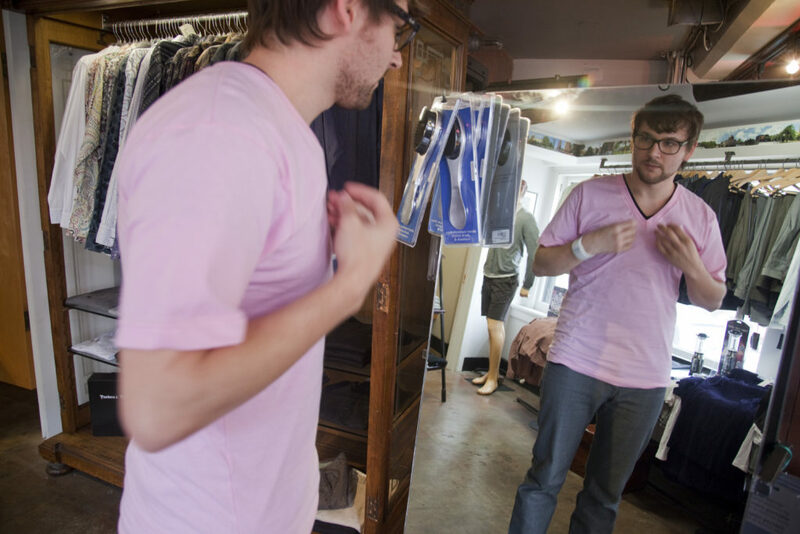 Ryan Estey, an employee at Hobbs, 700 Mass., tries on a pink shirt. Carson Kressley, the fashion expert who once starred on “Queer Eye for the Straight Guy,” has no problem with guys wearing pink. He says pink adds a bright pop to a simple jacket or a pair of traditional khakis. He says men can go as bold as they dare with pink, or just add a rosy touch to their outfits. Pink may be just the thing for a New York-based fashion guru, but what about guys here in Lawrence? Shauna Swanson, buyer of men’s fashion at Hobbs, 700 Mass., says she’s seeing more pink on Lawrence men. Swanson says that pink often denotes an old-school preppy look. Lawrence resident Ryan Estey, 23, who works part-time at Hobbs, agrees. His idea of the perfect outfit? “A slim-cut gray pinstripe suit and a pink button-up shirt with a skinny, gray, square-bottom knit tie,” he says. Soelter admits that there are definitely guys who can pull that look off. “I think that jocks or really popular guys tend to wear pink,” he says. Lawrence freelance writer and book critic Adam Murphy, 25, reads a lot of fashion blogs. He says he doesn’t mind the trend but wouldn’t wear pink himself. Murphy is more a fan of “subtle pink” or “salmon-colored” shades.